Pianist/composer Steve Rivera’s first album, The S Collection, was released in 1997. 1,100 copies were sold exclusively through Nordstrom’s Gift Gallery and three pieces were played on Nordstrom’s Muzak System nationwide. 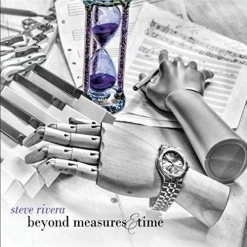 That opened a lot of doors for Rivera, but he didn’t release his second album until now. Dividing the Darkness was produced by Will Ackerman and Tom Eaton, and what a beauty it is! Backed by the stellar line-up of musicians at Imaginary Road Studios, Rivera’s gorgeous piano work sings, soars, dances, and weeps. Eight of the nine tracks on this outstanding album are ensemble pieces for piano and a variety of instruments and the ninth is a piano solo. Rivera started learning to play the piano from his father (also a musician) at the the age of eight and by the time he was thirteen, he was playing at church functions and in bands ranging from punk rock and alternative to blues and jazz. After high school, Rivera realized that music was what he wanted to pursue in life. He majored in composing and conducting at Hope University, toured as a member of a singing group, and interned at several churches as an assistant music director. He has composed, performed, and recorded for several musical theatre productions, has scored a film, and performs at a number of upscale restaurants, resorts and clubs in Southern CA. Dividing the Darkness is certain to broaden his audience and following considerably! 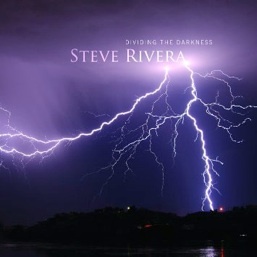 Dividing the Darkness begins with “My Way Home,” a warm and gentle piece that features Charlie Bisharat (violin), Eugene Friesen (cello), Jeff Haynes (percussion), Tony Levin (NS bass), and Noah Wilding’s ethereal vocals along with Rivera’s piano. The simple melody is heartfelt and direct, and the lead musicians share the spotlight - a very promising start! “This Ancient Road” goes darker and more poignant, this time featuring Friesen, Haynes, Jill Haley (English horn), and Tom Eaton (electric bass and guitar). “Help Me to Listen” is a deeply personal prayer that is simple and sincere. Premik Russell Tubbs adds an earthy yet haunting quality with electronic wind instruments - a favorite. “Skyward” begins with a flowing piano intro before Bisharat, Levin, Wilding, Friesen, and Haynes send it soaring to the heavens. “So Quickly Gone,” a trio for piano, guitar (Ackerman) and keyboards (Eaton) is slow and uncomplicated but makes a deep emotional connection - another favorite. I absolutely love the intense and powerful “Delicate Force.” The piano leads most of the piece, but Wilding’s voice sends chills down the spine while Haynes’ percussion ups the passion and Eaton’s guitar and keyboards add subtle colors. This wonderful piece has caused me to repeatedly hit the replay button! The only piano solo is the closing “Skyward Coda.” Peaceful and soothing, this piece is actually in segments with silence between them. The first part is a little more than a minute with about 30 seconds of silence. The second part is even more serene, with lots of reverb for atmosphere, gradually fading away at the end. Dividing the Darkness is a great album that is likely to be on my Favorites list for 2015! It is available from steveriveramusic.com, Amazon, iTunes and CD Baby. VERY highly recommended!